Angel Vivaldi Discusses His New Album Synapse - Welcome To All That Shreds Magazine! Influenced by the reverberating aura of the legendary ancestors and self-confined by the bars set by the ancestral musicians, the younger generations of musicians often refrain from risking their careers with an experimentation of techniques and tend to follow the set blueprints. It only happens once in a blue moon that an amateur minstrel emerges within the musical sphere and attempts to infuse their imprints on the well-grounded skills and techniques. 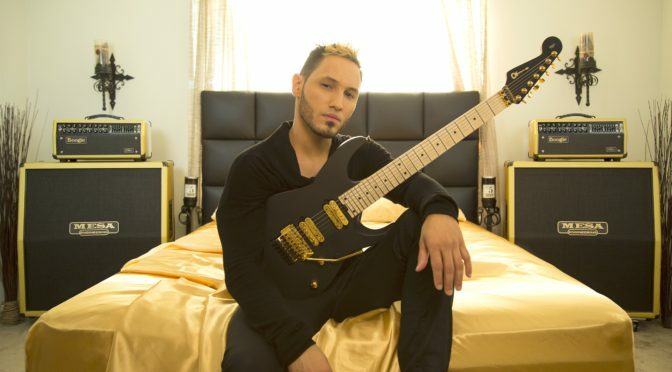 Angel Vivaldi is one such name; a young enthusiast with a penchant to lead the refinement and improvisation of the rock guitar genre in the present era. Angel Vivaldi is a budding name whose works and techniques have stirred the long prevalent status quo of the music sphere. Born in New Jersey on 13th June 1985, Vivaldi got his hands on his first ever guitar at the age of 15. His fingers first encounter with the chords was the defining moment of his life and sparked his passion for music. He embarked on his mission to learn the basics and intricacies of the chords from Metallica, Nirvana, and Chevelle, all of whom happened to be his primary influences. Vivaldi coupled his learning with his improvisations, and after a strenuous haul of efforts, successes, and setbacks, he stepped out of his incubation phase, releasing ‘Revelations’ in 2008. The debut album turned out to the litmus test of his talent and his playing style resonated enough to attract multiple bands who later invited him to join their platform. Angel Vivaldi partnered with 40 Below Summer in a permanent capacity as the lead guitarist. The group then ventured into a joint feat with the detached member of Flaw to establish a new entity called the Black Market Hero. Aside from strengthening his band associations and performing on a series of tours and concerts, Angel Vivaldi also focused on establishing his solo profile and released another solo album titled ‘The Speed of Dark’ in 2009. Later, Angel Vivaldi bid farewell to Black Market Hero and embarked on a solo fight. 2 years later, he released ‘Universal Language’ which brought him significant applause from the camps of the audiences and critics alike. The album turned out to be the beginning of a new association. Will Putney of The Machine Shop, one who refined and produced ‘Universal Language,’ also funded and backed Vivaldi in releasing Volume 1 of ‘Away with Words’ in 2014. Angel Vivaldi has performed numerous solos as well as on tours and has also made special guest appearances on TV shows. Volume 2 of ‘Away with Words’ is still a work in progress as Vivaldi slowly progresses to establish his signature forte of pure instrumental rock. Vivaldi aspires to inspire the music sphere with the purity of absolute instrumentals. Eliminating lyrics and vocals from a number bring the background score and supporting instruments to the forefront. Promoting rock and pop instrumentals through his captivating pulls, jolting breaks and ecstatic beats, Angel Vivaldi continues to pursue his passion for streamlining instrumentals with modern rock and heavy metal. We spoke with Angel about his new album, Synapse that will be released on October 6, 2017. Each new song describes a brain chemical. Painting the different studio colors, how did that help with your creativity for writing the new album? AV: The process for Synapse while extremely involved and overwhelming, was well worth it. Redecorating/painting my studio for each song not only provided a constant stream of inspiration but also kept me focused on the intention for each neurotransmitter/brain chemical. It’s easy to lose track of what you’re aiming during the writing process, but having a massive purple wall in front of you helps to keep an individual focused! I saw you and Gus G on your tour (One of the loudest concerts in such a small venue), did you pick Gus G, Nita Strauss and Oil Hebert for a particular reason/brain chemical? AV: Absolutely. It was a very well thought out process to make sure each song/section was not only appropriate for their style/energy but also my relationships with each. Gus G plays on Oxytocin, which is the bonding molecule represents the bond we made during our US tour last Fall. Nita and I always have a blast together, and with her being one of the most positive energies I’ve come across I knew her style would be ideal for Serotonin. Same with Oli who performs on Dopamine – the progression suits his style perfectly. The videos you do for a song are very creative and thought out. How many videos will you be releasing with Synapse? AV: I had already released the first video single for Dopamine last month. My second video single will be released shortly before my album comes out early October. Many more videos are planned as well. I want to put strong visual content along with each song for Synapse. Have you thought about putting an all acoustic EP/Record out? AV: Away with Words Part 2 is an all acoustic record that will be released after the Synapse album cycle. It has been written for a while, but after releasing many EP, I felt it was time to release a full album instead of yet another EP. What is your opinion of the all-instrumental guitar market? Do you believe it’s making a comeback? Too many sounds alike? AV: I think it’s great and very inspiring for many players to up their game, no doubt! It’s amazing to see people pushing the boundaries of this limitless instrument. However, (much like any genre these days) there’s a lot of oversaturation as well. There seems to be a big wave of younger guitarist who is technically great but has no sense of individuality just yet. Every musician goes through this phase, myself included! The only difference is that my generation matured out of the public eye since the internet wasn’t as prevalent. I’m anxious to see what happens as they grow and mature throughout their careers. AV: 2018 will be spent touring and shooting all of the video content for Synapse which will include not only full production music videos but also play-throughs as well.